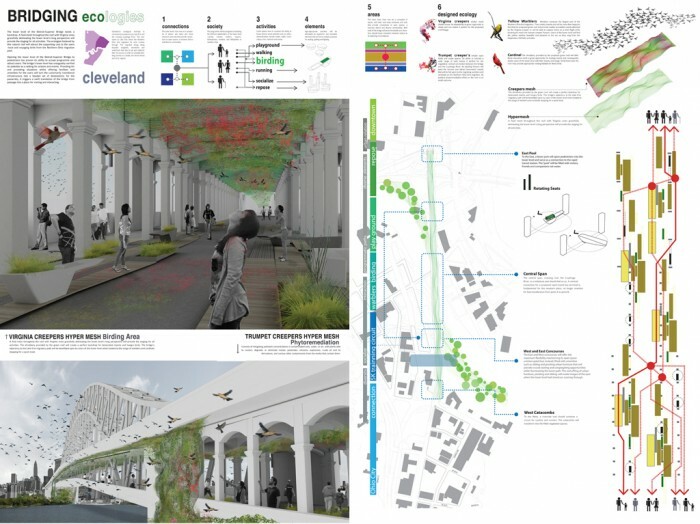 Overview: Opening the lower level of the Detroit-Superior Bridge to pedestrians has proven its ability to accept programme and attract users. The bridgeÕs lower level has unarguably verified its potential as a setting for actions and events. 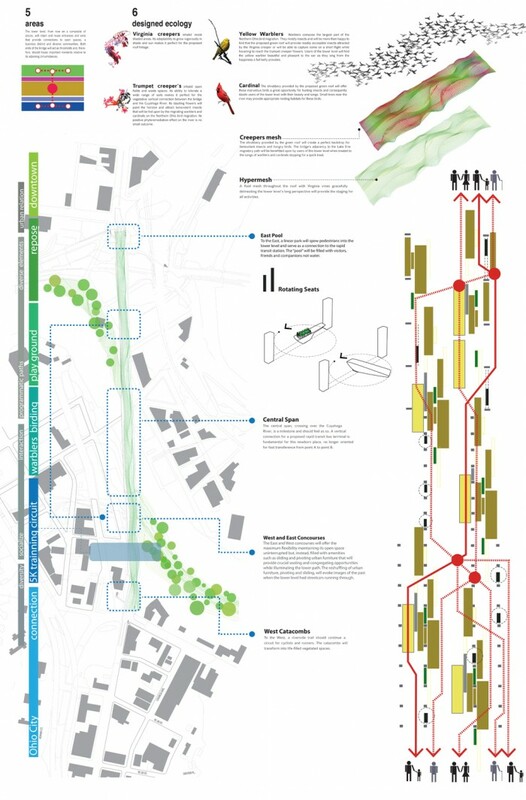 Providing for and provoking situations whilst offering facilities and amenities for the users will turn the customarily transitional infrastructure into a beaded set of destinations; for the passersby, it triggers a swift translation of the bridge from passage into a place for visiting and interacting. The lower levelÕs potential to become a lineal venue is supported by its extension. The bridgeÕs length (1 km) is just under the length as La Rambla (1.2 km), longer than the Sambadrome in Rio (.7 km) and the uninterrupted section of the Washington between 7th and 14th Street (.84 km), and two and a half times the length of the Paseo la Princesa (.4 km). All of these lineal spaces have in common the ability to house diverse social activities such as rallies, demonstrations, bicycle routes, walks, races, culinary fairs, festivals and samba. The lower level of the Detroit-Superior Bridge needs a backdrop. A fluid mesh throughout the roof with Virginia Vines gracefully delineating the lower levelÕs long perspective will provide the staging for all activities. ClevelandÕs ecological diversity is conveyed by its adjacency to Lake Erie and the crossing Cuyahoga River. 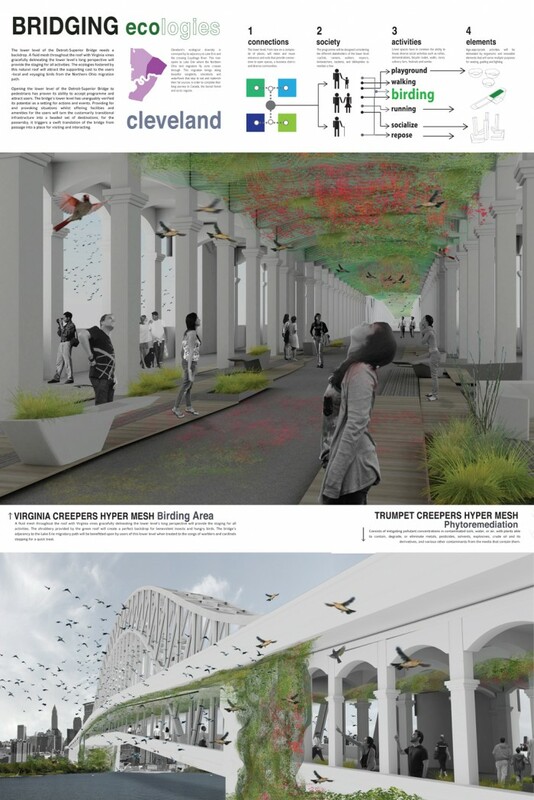 The ecologies fostered by this natural roof mesh will attract the supporting cast to the users Ðlocal and voyaging birds from the Northern Ohio migration path.